You’re staring face to face with one of the most decadent, delicious, and drool-worthy desserts on this planet. No, that is not an overstatement. 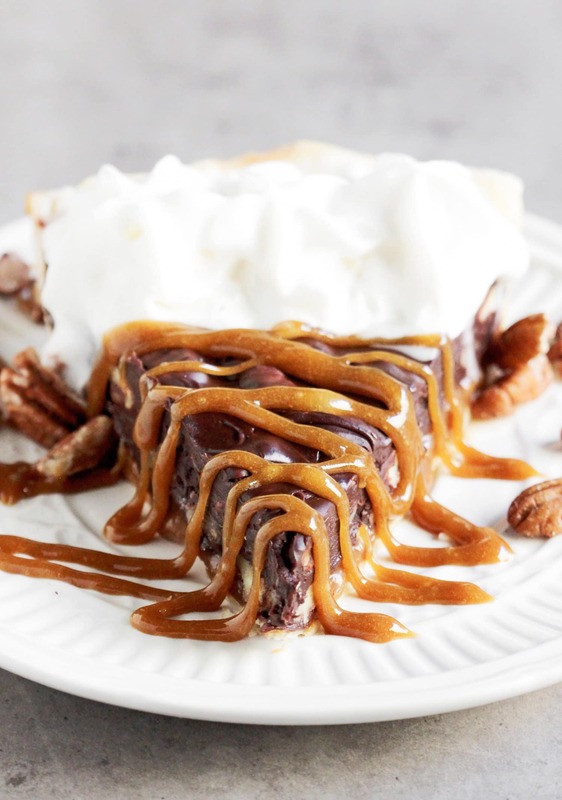 This Turtle Pie tastes SO incredible you’ll wonder how on earth it can possibly be vegan, dairy free, and all natural! The pie crust is buttery and rich, and has the perfect flavor to offset the thick layer of sweet and chewy caramel. On top of the caramel is the creamiest of the creamy and dreamiest of the dreamy chocolate ganaches EVER, which is studded with a handful of toasted pecans. This is literally like one of those Turtle candies, just supersized! One bite and you’re in for a real treat. Turtles and I go wayyy back. I used to eat an obscene amount of those confections as a kid. Most people associate Turtles with the holidays, but me? I ate them year round, of course. With every bite you instantly get the creamy milk chocolate flavor, and then the caramel flavor strikes as you notice the slight crunch from the pecans. 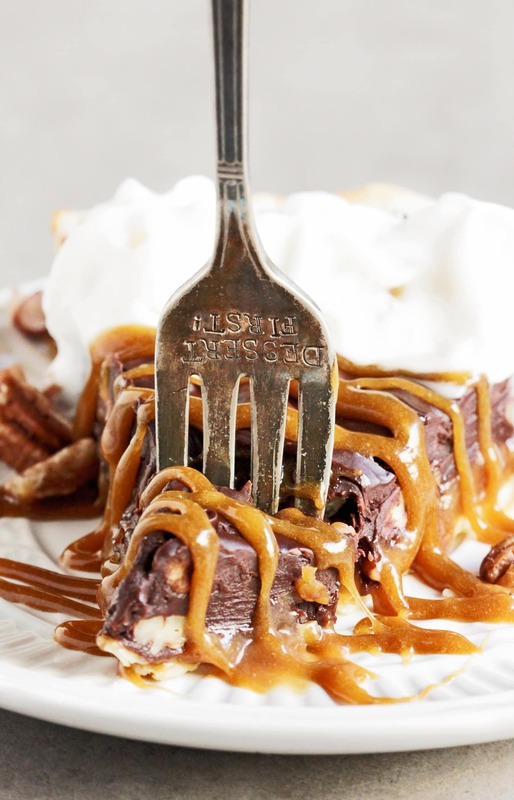 Turtles may be small, but dang, they sure are decadent! That’s probably why Turtle Pies are sold in grocery stores. Unfortunately, they are made with the most horrendous ingredients on the planet — chemically bleached flour, dangerous hydrogenated oils (trans fats), preservatives, and a ton of sugar (sugar is listed 6x in their long ingredient list). Now, let’s just imagine Turtles and those storebought Turtle Pies REMADE. Instead of milk chocolate I used dark chocolate. Instead of white sugar and corn syrup I used a range of healthier alternatives, including pure maple syrup, sucanat, erythritol, and stevia extract. Instead of using pie crust made with bleached flour and hydrogenated oils I used Immaculate Baking Co.’s ready-to-bake pie crust, which is made with unbleached, unbromated wheat flour, natural oils, and absolutely no preservatives or artificial food dyes. This Turtle Pie tastes SO incredible you’ll wonder how on earth it can possibly be vegan and dairy free! The pie crust is buttery and rich, and has the perfect flavor to offset the thick layer of sweet and chewy caramel. On top of the caramel is the creamiest of the creamy and dreamiest of the dreamy chocolate ganaches EVER, which is studded with a handful of toasted pecans. Bring the rolled pie crusts out of the fridge and let them sit at room temp for about 20 minutes, or until soft (if you unroll it cold, it will tear). Unroll the pie crusts into two 9.5" pie pans. Bake for ~11 minutes, or until just golden brown. In a medium-sized bowl, whisk together the coconut milk, coconut oil and salt. Set aside. In a 2-quart saucepan, add the maple syrup, water, sucanat and erythritol. Do not stir. Add a candy thermometer to the saucepan, then place the pan over a stove set to medium-high heat. Without stirring, let the mixture come to a boil. When it reaches 250 degrees Fahrenheit (it takes me ~7-8 minutes), remove the pan from the heat and whisk in the set aside coconut milk/oil mixture. Return the pan to the heat and let it come to a boil again. When it reaches 266 degrees Fahrenheit (it takes me ~10 minutes), turn the stove off and remove from the heat. Very carefully, add the vanilla extract. It will bubble up vigorously, so watch out! Pour the caramel into the prepared pan. Let cool completely at room temperature. Divide the caramel in half between the two pans to create the caramel layer. In a double boiler over medium heat, add the chocolate and coconut milk. Stir occasionally until completely melted. Whisk in the stevia extract, then stir in the toasted pecans. Divide the mixture in half between the two pans. Refrigerate until completely firm. 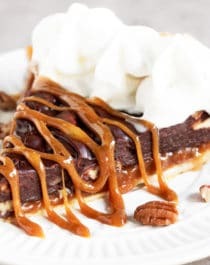 Slice and serve with all natural whipped cream, Homemade Caramel Sauce, and chopped pecans! This pie is very rich, and I recommend slicing each pie into 12-16 slices. Caramel adapted from the Soft Caramels recipe in the Naughty or Nice Cookbook. Can’t you tell by this picture how chewy the caramel is and how creamy the ganache is?? OMG do I even want to know the nutrition on this? Looks delicious! Loving my naughty or nice Cookbook highly recommend to people!! Also thanks Jess for always answering questions for your readers! Thank you so much Emily! I’m glad you’re enjoying your cookbook and thank you so much for recommending it to friends! I try my best to answer everyone and I truly hope you love this Turtle Pie! I try my best to fit in different dietary needs. I’m glad you get to be dairy free while enjoying a delicious Turtle Pie!